Himalayan crystal salt has matured over the past 250 million years under intense tectonic pressure in an environment that’s free of toxins and impurities. Some salt crystals from the Himalayas have an off-white to transparent color, while impurities in some veins of salt give it a pink, reddish, or beet-red color, so not all the Himalayan salt is pink. This salt it’s popular in Ayurvedic, Tibetan, and other traditions. I believe that Himalayan salt’s unique cellular structure allows it to store vibrational energy. Spiritually speaking, salt is considered the great neutralizer. 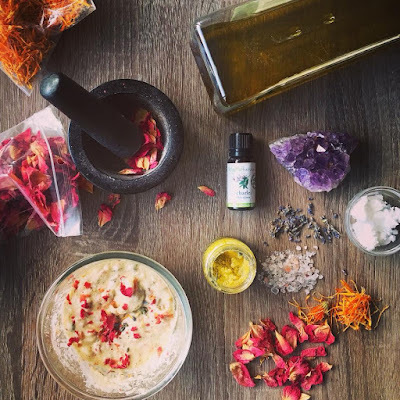 It can help cleanse, heal and balance energy, while repelling negative vibrations; a salt spray or even better a salt scrub is perfect to cleanse your aura from all kind of bad juju. I regularly cleanse my aura and my personal energy with a home made Himalayan salt body scrub blended and infused with best organic and botanical ingredients (coconut oil, sweet almond oil, flower petals, essential oils and Amethyst)- DETOX,CALM, RENEW. This rich and nourishing salt scrub is a great remedy for my body and my mind and its actually really easy and fun to make. 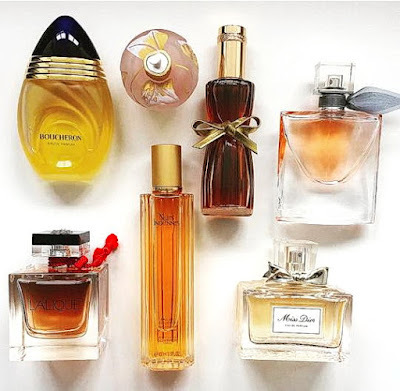 I recently updated my perfume collection and thought to share with you my Winter favorites. for the cold season I love a heavy, spicy and warm scent, something dense and decadent. Boucheron Pour Femme Eau de Parfum is a brilliant, sensual, floral and Oriental fragrance that opens with sparkling fruit notes while its soft signature is filled with a voluptuous bouquet of white flowers. This perfume is a classic, very rich and old school, mostly for special occasions, but that never stopped me to wear it whenever I wanted. I would not describe it spicy, warm, powdery and animalic in a sensual way. It has an amazing silage (very heavy ) and on me and it lasts the entire day, sometimes even after shower if I used too much. Notes: Top: orange blossom, mandarin. Middle: jasmine, ylang-ylang, tuberose. Base: amber, vanilla. This perfume is not for everyone, is daring and very dramatic, comes from a different era and you need to smell it with your brain to understand its complexity, its so much more behind those few notes mentioned. This perfume demands a certain attitude and a certain glamour, you can't just spray it on and wear it with jeans and a simple white t-shirt. Too dramatic to wear it every day but quite amazing !